The Kyrgyz presidential elections are a positive sign for democracy in the Central Asian region. However, a recent quarrel between Kyrgyzstan and Kazakhstan tarnishes the picture and threatens regional integration efforts. President-elect Zheenbekov is confronted with crucial decisions concerning the formation of a government. The presidential elections in Kyrgyzstan held on 15 October were remarkable in many respects. In a region that is first and foremost associated with autocrats only to be toppled by revolution or natural demise, Kyrgyzstan made history this year by holding Central Asia’s first ever competitive election. Surrounded by Kazakhstan where Nursultan Nazarbayev has been reigning since 1990, Tajikistan with its lifetime “Leader of the Nation” Emomali Rahmon in power for a quarter century, and Uzbekistan, where Shavkat Mirziyoyev was elected with 89% after Islam Karimov’s decades long leadership came to an end, Kyrgyzstan witnesses the region’s first peaceful transfer of power from one elected president to another. The outcome was no less astonishing than lead-up to the election, as Sooronbay Zheenbekov, incumbent president Almazbek Atambayev’s personal pick, unexpectedly gathered 54% of the vote; avoiding a runoff with businessman Omurbek Babanov in a second round. Although widely perceived as free – mainly due to a modern voting system based on bio-metric registration – OSCE addressed the burdensome nomination process for candidates and reported minor violations such as vote-buying on election day. Owing to the competitiveness of the vote, the election campaigns between the two major opponents Zheenbekov and Babanov were characterized by the dissemination of compromising material and the massive abuse of administrative resources. For instance, after a rally in the southern city of Osh on 28 September during which he addressed the Uzbek minority, Babanov was accused of inciting ethnic hatred, a sensitive issue after the2010 riots which resulted in hundreds of casualties. Having commenced his business career in Kazakhstan, once holding a Kazakh passport, Babanov was an easy target when it came to questioning loyalty to the Kyrgyz state, especially after reports of his clandestine meeting with Kazakh and Russian oligarchs on the banks of lake Issyk-Kul in early September were leaked into the public. However, what might have struck Babanov with the strongest blow was Nazarbayev’sinvite to Astana on 20 September, after which incumbent president Atambayev deplored the alleged Kazakh meddling into Kyrgyz internal affairs; pointing to the Kazakh government’s corruption. Kazakh-Kyrgyz quarrels: potential threat for regional integration? What might have been intended as a pre-election gambit to discredit Babanov has developed into a fully-fledged international dispute between two member states of the Eurasian Economic Union (EEU). After Atambayev’s remarks, Kazakhstan on 10 October reintroduced border controls and customs checks to Kyrgyzstan and partially suspended the import of dairy products, which has led to massive congestion and economic damage to Kyrgyz companies. As Kyrgyzstan reciprocated, Southern Kazakh and Northern Kyrgyz regions experienced shortcomings in a myriad of sectors. Labour migrants’ free movement on both sides of the border is restricted. Kyrgyzstan has alerted the WTO Dispute Settlement Body to Kazakhstan’s commitment violations. After Kazakhstan’s threats to re-impose sanitary and phytosanitary controls as well as checks of Kyrgyz national residence permits, Atambayev questioned his country’s membership in the EEU Customs Union and reminded his partners that “we have other neighbours as well”. To lend weight to Atambayev’s words, the Kyrgyz government officially renounced a USD 100 million technical aid package from Kazakhstan – granted on a Supreme Council Meeting of the EEU in December 2016 – to assist the Kyrgyz process to harmonize itself with the Custom Union’s standards after Kyrgyzstan had refused to sign the new EEU Customs Code Treaty. Kazakhstan, being less dependent on Kyrgyzstan economically than vice versa, has nearly unlimited escalation range to put pressure on its southern neighbour. 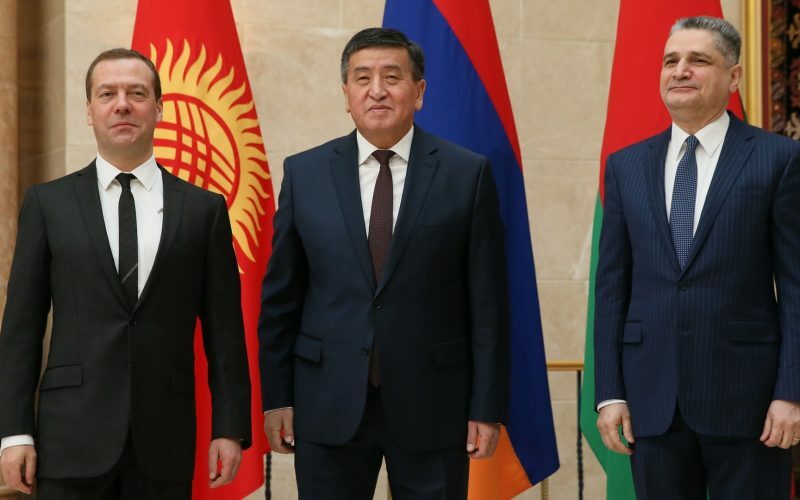 However, Bishkek announced that it could consider tapping the Kirov water reservoir located in northern Kyrgyzstan, which would deprive bordering Kazakh regions of their water supply. One of the most remittance dependent countries in the world (30% of the GDP in 2016, estimated at 37.1% for 2017), Kyrgyzstan relies heavily on its EEU membership. However, Uzbekistan and Tajikistan, whose nationals also predominantly work in former Soviet neighbour countries, have shown the ability to manage fairly well in this respect outside the EEU. Although the probability of Kyrgyzstan leaving the EEU can be assessed at a minimum, the current spat has revealed latent resentments between the member states and does not bode well for the organisation, and may daunt potential candidate states, such as Tajikistan. Kazakhstan’s harsh reaction to Atambayev’s diatribe might be induced by the recent rapprochement between Kyrgyzstan and Uzbekistan, which experienced a certain thaw under President Mirziyoyev. Kazakhstan, largest by territory and economy among the five post-Soviet Central Asian republics, sees its dominant regional role challenged by an increasingly engaged Uzbekistan. Bishkek could further reinforce its relations to Tashkent in order to lower its dependence on Kazakhstan. Russia would be well-advised to mediate in the regional developments in order not to see its economic (EEU) and security (CSTO) integration efforts jeopardised. A Kremlin press release suggests that the election outcome suits Russia. Zheenbekov appears to be a convenient president in Moscow’s view. During his campaign, he asserted that he would continue Atambayev’s policies, although it is hard to determine what has constituted the latter’s tenure apart from delivering stability to Kyrgyzstan after the 2010 revolution. Zheenbekov will struggle to find broad support among the population after a divisive election campaign and a comparably thin mandate having received the smallest vote for an elected president in the country’s history (at a turnout of 56%, only about three in ten Kyrgyz effectively voted for him). With his major opponent Babanov being backed by a third of the electorate, Zheenbekov is walking a tightrope. Atambayev’s conspicuous bias has fuelled rumours he might want to stay in the government – potentially as new prime minister or faction leader of his social-democratic part – as the competencies of prime minister and parliament had been widened after a constitutional referendum last December. Other potential candidates for the post of prime minister are incumbent Sapar Isakov or Omurbek Babanov, who served in the same role in 2012. On the one hand, this latter scenario would accommodate a large part of the electorate. On the other, Babanov, whom Zheenbekov blustered to imprison after the election owing to his alleged corrupt business activities, might instead want to prepare for the next elections on the opposition bench. Zheenbekov, who is widely perceived as Atambayev’s puppet has to form a government by 1 December, and does not enjoy his entire party’s trust. By barring party leader Atambayev from pivotal executive positions, he would, on the one hand, refute critics who doubt his autonomy, but on the other would possibly lose even more support from the social democrats. If Atambayev strives for further curtailing of the president’s constitutional authority, Zheenbekov might see himself confronted with the decision to give in or risk the disintegration of the ruling party. This could play into the opposition’s hands for the next elections. This article was originally published on Global Risk Insights, and was written by Tobias Vollmer.